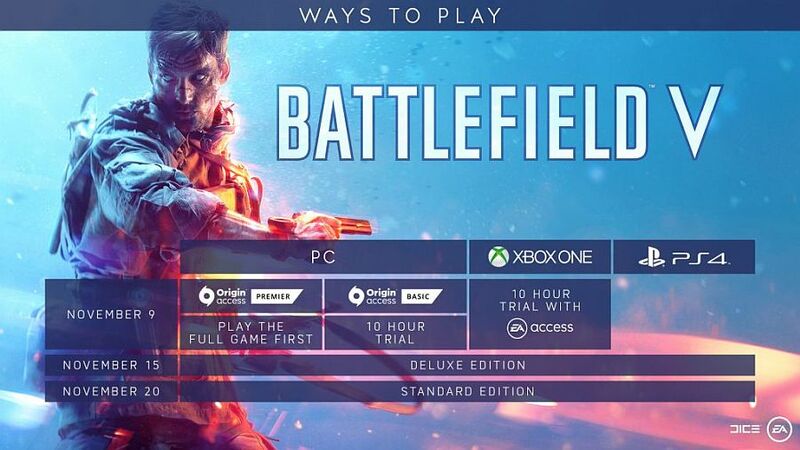 PC players will be able to play Battlefield V an extraordinary 11 days before the standard edition releases – provided you’re willing to shell out for EA’s Origin Access Premier scheme. According to an announcement on EA’s site, members of Origin Access Premier will get to play the full game on November 9. Members of Origin Access Basic will get a ten-hour trial on the same day, as will EA Access members on Xbox One. Those outside of such programmes can play on November 15 – the earliest date PlayStation gamers can get involved – if they opt for the Deluxe Edition. The Standard Edition releases on November 20. Here’s the news via EA. Origin Access Premier will cost you $14.99 (£14.99) a month, or $99.99 (£89.99) a year. Basic is far more palatable, at $4.99 (£3.99) a month and $29.99 (£19.99) a year. Besides full early access rather than a ten-hour trial, Premier also gets you some extra content with new games, such as mictrotransaction bonuses and even expansion packs in some cases. All that stuff, plus 11 whole days of early access, is quite a thing to gate behind $100 a year. But then, given the base game is $60 and comes with none of Premier’s perks (or library of 155 other games), EA would no doubt argue that the scheme represents decent value for money. If you’re excited for EA’s next epic war sim, you’ll learn much more than the Battlefield 5 release date with our guide to everything we know so far. That includes campaign details, classes, system requirements, and the release window for its battle royale mode, Firestorm (it’s not until spring next year).